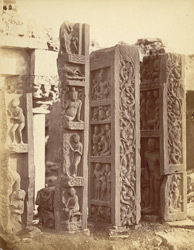 Photograph of four Buddhist railing pillars found at Garhwa, taken by Joseph David Beglar in the 1870s. Garhwa has yielded sculptures depicting both Buddhist and Hindu themes. In his Report of tours of 1874-75, A. Cunningham wrote, "The architectural remains exhumed are of great interest, as they are of very superior execution, and must certainly belong to the period of the Guptas, whose inscriptions were found with them...The two tall pillars are known to be the side-pieces of an entrance from the two similar pillars which are still standing in situ in the ruins of Kumara Gupta's temple at Bilsar...The ornamentation on the side of the pillar...consists of the undulating stem of a creeper, with large curling and interwining leaves, and small human figures, climbing up the stem or sitting on the leaves in various attitudes...At the top the scroll is only traced out...I conclude therefore that this portion must have been concealed by a square cap or abacus."